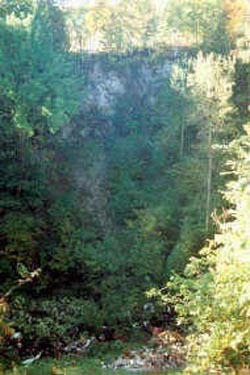 The Thunder Bay Karst Preserve combines two adjoining preserves obtained by the conservancy in the 1990s. The Stevens Twin Sinks Preserve is a 31-acre parcel purchased in 1993 with gifts from William and Archie Stevens and other members and friends of the MKC. In it are two sinkholes separated by a fragile saddle ridge, each about 200 feet in diameter and 85 feet deep. The 2.5-acre Bruski Sink across Leer Road was donated to the Conservancy in 1996 and made part of the Thunder Bay preserve. Though there are more than 200 sinkholes in Michigan’s northern lower peninsula, most are located on private property. Only the sinks at Thunder Bay Karst Preserve and Shoepac Lake State Forest Campground to the west are available for public access. The MKC restricts access to the Stevens Twin and Bruski sinks to protect their thin soil cover, as well as for safety reasons. Visitors to the preserve can follow walking trails that offer views of the sinkholes and a nature trail near the Stevens Twin Sinks. MKC volunteers mow the trails monthly during spring and summer. A spur on Sinkhole Trail leads to earth cracks which indicate the sink continues to slowly collapse and widen. Nature Trail branches off and returns to Sinkhole Trail after meandering through a beech grove. Another short trail follows the south and east walls of Bruski Sink. A thick layer of Devonian limestone and shale, known as the Traverse Group, underlies Alpena and Presque Isle counties. Below that, about 800 feet deep, lies the Detroit River Group, which contains large amount of the evaporites anhydrite and gypsum. These minerals dissolve much more readily than limestone, and as the Detroit River Group rocks erode and create caverns, Traverse Group rocks above collapse into the caverns, creating sinkholes. Evidence for the dissolving of the Detroit River Group evaporites shows up where the water that goes underground in the sinkholes returns to the surface from submerged sinkholes in Lake Huron, 20 miles to the east. The resurgent water is saturated with gypsum. The grouping of the Twin and Bruski sinks indicate they are aligned along joint trends in the rock. Water worked its way along joints and cracks in the limestone to reach the underlying evaporites. The fact that the sinkholes are not filled with the glacial outwash (sand and gravel) that covers the bedrock elsewhere, indicates they grew deeper after the last glaciers melted (it is not known how deep glacial outwash fills the sinkhole bottoms), but the exact relationship between the glacial deposits and sinkhole formation has yet to be discovered. Along with sinkholes, an earth crack in the northeast corner of the preserve is more than 150 feet long. Such cracks are caused by “slumping” of rock as the layers beneath erode away. The hummocky terrain in the preserve and to the east results from large rock blocks collapsing and settling, and often shattering in the process.